On 10th January 1582 Howell Gruffydd Lloid and Gruffith Lloid ap Reis David Llywelen, both of Tredroir (Troedyraur), Cardiganshire, were granted the messuage here by John Mortimer of Coedmore, Llechryd, for a bond of £100. On February 20th 1596 Dythgy Verch Meredith, spinster, was the owner of Cilbronnau and mortgaged it to Gruffith David ap Rhydderch. On 20th January 1601 Dyddgu Meredith granted the tenement to her son, Richard Griffith, yeoman. Also on 20th January 1601, Richard Gruffith made a gift of the property to Griffith David ap Rhydderch, with land called “Y Cleyn Poeth” and “Knowk yr Eithin”. On 15th October 1603 Morgan Thomas ap Rhys ap Gwilym granted Cilbronnau to Roderick ap Meredith of Llangoedmor. On 25th June 1697 Jenkin Griffith married Ellinor Jenkin, daughter of Jenkin Griffith of Cilbronnau and sold land to Alban Hugh and Owen John. In 1700 Gruffydd Jenkins of Cilbronnau married Ellen, daughter and heiress of Jenkin ap Gruffydd ap Dafydd ap Rhydderch ap Maredudd and his wife, Maud, of Blaenporth. In 1731 probate was made of the will of Griffith Jenkins of Cilbronnau. In 1738-70 Jonathan Jenkins, eldest son of Griffith & Ellen Jenkins, lived here. In 1738 Jonathan Jenkins married Elizabeth Lewes, youngest daughter of John Lewes of Tredefaid, Llantood. Their pre-nuptial settlement was dated 13th December 1738. His mother, Ellen Jenkins, was still living at that date. In 1743 Griffith Jenkins was born and lived here in 1743-81. On 2nd February 1767 Jonathan Jenkins was a burgess of Cardigan. On 8th April 1770 John Jenkins (“Ifor Ceri”) was born here, at what was then referred to as ‘Cilbronnau Farm’. On 1st August 1770 Jonathan Jenkins of Cilbronnau wrote his will. He referred to his wife Elizabeth Jenkins; his eldest son – Griffith Jenkins; and his daughter, Mary Jones, who was married to Thomas Jones of Cardigan. Jonathan Jenkins died in 1770 and his only son, Griffith Jenkins, succeeded. By 1774 Griffith Jenkins had married Mary Morris, daughter of John Morris of Bachendre. Their son John Jenkins was born in 1774. Ca1780 Griffith Jenkins was born here, the youngest son of Griffith Jenkins. On 2nd March 1781 reference was made to Elizabeth Jenkins of Cilbronnau, widow of Jonathan Jenkins, and Griffith Jenkins, their only son and heir, and his wife Mary Jenkins, who lived here. Griffith & Mary Jenkins had a daughter, also Mary Jenkins, who married Thomas Jones, mariner, of Cardigan. On 12th October 1781 Griffith Jenkins of Cilbronnau wrote his will. He referred to his sons – Jonathan Jenkins; Thomas Jenkins; Jeremiah Jenkins; and Griffith Jenkins – all minors. Griffith Jenkins died on 13th October 1781, aged 38, leaving Mary Jenkins, his widow, and five sons. The five sons of Griffith Jenkins were:- Rev. John Jenkins, M. A., Vicar of Kerry, Montgomeryshire, who married Elizabeth Jones, daughter of Rev. Edward Jones of Berriew; Jonathan Jenkins, who married Adeliza Gower of Glandovan, Cilgerran; Thomas Jenkins, a commander in the Hon. East India Company’s Maritime Service, of Penrallt, Aberporth; Jeremiah Jenkins, a doctor and surgeon in the Royal Navy; and Gruffydd Jenkins, who married Anne Jones, daughter and co-heiress of Richard Jones of Pantirion, St. Dogmaels. In 1781-98 Mary Jenkins still lived here. On 3rd October 1796 Jonathan Jenkins of Cilbronnau was a burgess of Cardigan. In 1800 Jeremiah Jenkins was admitted M. R. C. S. – became a doctor. By 10th November 1799 John Jenkins, late of Whippingham on the Isle of Wight, had returned to live here. In 1799-1829 Rev. John Jenkins lived here. On 30th September 1805 Rev. John Jenkins was a burgess of Cardigan. In 1814 reference was made to his brothers Jeremiah and Griffith Jenkins. On 1st August 1815 Richard David Jenkins was born, the son of Anne & Griffith Jenkins, youngest son of the elder Griffith Jenkins of Cilbronnau (of Pantirion, St. Dogmaels). In October 1821 an inscribed silver goblet was stolen from Cilbronnau. In September 1824 Mrs. Mary Jenkins of Cilbronnau died aged 82. In 1825-51 Jonathan Jenkins lived here. In 1825-37 Jonathan Jenkins owned shares in the ship ‘Heart of Oak’, 137 tons. On 4th April 1826 Jonathan Jenkins married Priscilla Jenkins of Cardigan. In 1827 Rev. John Jenkins, former Vicar of Cerry, and Jonathan Jenkins lived here. In 1829 the Anglican squire, Rev. John Jenkins (“Ifor Ceri”) – genealogist, patron of bards and Eisteddfod revivalist, died. In 1833 Griffith Richard Jenkins was born here. In 1834-36 Jonathan Jenkins owned shares in the 63 ton Cardigan ship ‘Ardent’. In 1838 Cilbronnau was owned by Elizabeth Jenkins and occupied by Jonathan Jenkins. In 1840 Richard David Jenkins (of the Cilbronnau family) of Pantirion, St. Dogmaels, married Elizabeth Ann Bowen, the daughter of the late John Bowen of Tredefaid, Llantood. He had four children from his two marriages – Rev. Richard Bowen Jenkins; Mary Anne Jenkins; Margaretta Elizabeth Jenkins, who married William Picton Evans of Treforgan; and Lawrence Hugh Jenkins of Cilbronnau. Richard David Jenkins leased the Priory, Cardigan, from Philip John Miles. In 1841 the property was home to the following persons: Jonathan Jenkins, 65; Adaliza Jenkins, 50; James Jenkins, 10; John Jenkins, 11; Abel Jenkins, 9; Mary Jenkins, 6; Griffith Jenkins, 6; Letitia Jenkins, 4; and 9 staff – Anne Timothy, 25; Margaret Allen, 12; Martha Davies, 20; Esther Morris, 18; Owen Jenkins, 25; Thomas Davies, 20; Owen Samuel, 20; David Morgan, 20; and Ann Davies, 19. In 1841 Jonathan Jenkins owned shares in the 161 ton Cardigan ship ‘Boudicea’. In 1841 Richard David Jenkins became the Mayor of Cardigan. In November 1842 Adeliza Jane Jenkins died here aged 50. R. D. Jenkins became the Mayor of Cardigan again in 1843, 1846 and for the fourth time on 9th November 1849. Jonathan Jenkins died in February 1851, aged 77. In 1851 James Jenkins, 20, estate agent, lived here with his servants – Hannah Evan, 15, house maid; Mary Morgan, 29, dairy maid; Anne James, 35, cook; Rachel Owens, 22, kitchen maid; John Jones, 58, general servant; and Evan Hughes, 16, stable boy. In 1854 James Heyward Jenkins lived here. In 1855 Richard David Jenkins became the Mayor of Cardigan for the fifth time, and was re-elected to serve the next consecutive term. In 1857 Lawrence Hugh Jenkins was born, the son of R. D. Jenkins. R. D. Jenkins continued for a seventh term as Mayor of Cardigan in 1857. Before beginning his eighth term of office in November 1858, he had to swear that he was a Christian, that he was worth at least £500, and that he would not interfere with the rights of the Established Church, its’ clergy or their benefices! He was re-elected in 1859. He attended a meeting of the Cambrian Archaeological Association at Cardigan on August 15th 1859. In 1860 Richard David Jenkins joined the newly formed Cardigan Company of Rifle Volunteers. The same year, he ended his record five years in office as Mayor of Cardigan. In 1861 Cilbronnau was temporarily unoccupied and conditions for sale were drawn up on 25th May that year. On 29th September 1861 part of Cilbronnau was acquired by R. D. Jenkins from his kinsman, John Heyward Heyward (Jenkins) for £1022. In 1863 R. D. Jenkins began his tenth term as Mayor of Cardigan. On 9th November 1865 he became the Mayor of Cardigan for the eleventh time. His twelfth term as Mayor of Cardigan began on 9th November 1867. In April 1866 Anne Jones died here aged 69. In 1883 Lawrence Hugh Jenkins became a barrister. In 1883 Anne Owens and Elizabeth Owens were servants here. Richard David Jenkins became the Mayor of Cardigan for a record fourteenth term on 9th November 1884. He died on 1st April 1885 whilst still in office, aged 69, and was buried at St. Dogmaels. Lawrence Hugh Jenkins was resident here in 1885-89. On February 19th 1890 Benjamin Lewis, coachman of Cilbronnau, was buried at St. Dogmaels, having died aged 69. In 1891 the following persons lived here: John Morris, 52, coachman; Mary Jane Lewis, 24, servant; Annie Williams, 25, servant; Anne Thomas, 32, servant; Sarah Hitchins, 19, servant; Margaret Lloyd, 18, servant; and Margaret Davies, 14, servant. In the early 1890’s Rev. Richard Bowen Jenkins returned to live here and became the Rector of Llangoedmor. In 1892 Lawrence Hugh Jenkins married Catherine Minna Brown – daughter of sugar plantation owners. In 1896 Captain Finzell of Cilbronnau became the first Captain of Cardigan Golf Club. Captain & Mrs. Finzell lived at Cilbronnau in 1896-98. In 1899 Lawrence H. Jenkins was made Chief Justice of Bengal and was knighted. He was later to become Chief Justice of the High Court of Calcutta. Other persons resident in 1899 included Benjamin Jenkins, Miss A. Jenkins and Mrs. Eliza Jenkins, G. H. Finzell, Miss Jessie Carry, E. M. Williams and Miss L. Baskerville. In 1900 the occupiers here included Miss Finzell, Benjamin Jenkins, Mrs. Eliza Jenkins and David Jenkins, John & Phoebe John. The house may have been remodelled that year for Sir Lawrence Hugh Jenkins, possibly to plans by David Jenkins of Llandeilo. Lawrence Hugh Jenkins was recorded at Cilbronnau in 1911. On 4th January 1914 Rev. Richard Bowen Jenkins died aged 70. By that time Glodrydd Jenkins, son of Sir Lawrence Hugh Jenkins, lived here. In 1915 Sir Lawrence H. Jenkins of Cilbronnau was appointed to the Privy Council. He retired in May 1915 and returned to Cilbronnau to live in September 1915. On November 30th 1916 Mary Davies, wife of David Davies of Garden Cottage, Cilbronnau, died aged 68. On 6th May 1919 Elizabeth Jenkins, wife of Benjamin Jenkins of Cilbronnau Cottage, died aged 81. In 1921 the Right Honourable Sir Lawrence Hugh Jenkins of Cilbronnau was President of Cardigan Agricultural Show. In 1923 Sir Lawrence Hugh Jenkins, Lady Jenkins and Clodrydd Jenkins lived here. In January 1924 Sir Lawrence H. Jenkins was appointed Chairman of the Cardiganshire Sessions. On 24th July 1926 Benjamin Jenkins of Cilbronnau Cottage died aged 86. Until 1926 the mansion itself was still the home of Sir Lawrence Hugh Jenkins & Lady Jenkins. In May 1926 Cilbronnau was sold to Rev. Enos Garnon Thomas. On 7th September 1926 there was a sale of contents here, at which some paintings brought good prices. On 23rd September 1926 there was a sale of stock, crops and implements here. On 1st October 1928 Sir Lawrence Hugh Jenkins, formerly of Cilbronnau, died. In September 1929 Sub-Lieutenant Glodrydd Lawrence Jenkins, only son and heir of the late Sir Lawrence Hugh Jenkins, bought back the family home “…for sentimental reasons…” On 4th October 1929 Rev. Enos Garnon Thomas held a sale of livestock and implements here. A Memorial window to Sir Lawrence Hugh Jenkins was unveiled at Llangoedmor Church on 7th December 1930. Glodrydd Lawrence Richard Jenkins died in Cairo in 1930. In January 1931 Rev. Enos Garnon Thomas died here aged 74. On 22nd August 1931 the house and estate were advertised for sale. Lady Jenkins died aged 64 on 10th July 1933 in Alexandria, Egypt. Cilbronnau then passed to a kinsman – Major Phillips. In January 1934 the Will of Lady Catherine Ninna Jenkins, widow of Sir Lawrence Hugh Jenkins, was proved. She had died in Egypt, but her home during the latter years of her life was in France. In 1935 Gethin Thomas lived here. On 26th May 1937 a demolition sale was held here and the main part of the house was pulled down, though only 37 years old, leaving just the former service wing standing. In 1939-50, Major G. A. Mitchley lived here. In 1946 Lieutenant Hugh Mitchley lived here. In August 1951 Colonel G. P. Phillips advertised the 5-bedroom property to let. In 1952 Mr. G. J. Griffiths, Mrs. Mary Griffiths, Mrs. Lidyard Griffiths, Miss Lizzie Griffiths, Elidyr Griffiths and Cadifor Griffiths occupied Cilbronnau. On 3rd October 1953 Elidyr Griffiths of Cilbronnau, son of Mr. & Mrs. G. J. Griffiths, married Miss Ann Elonwy Lewis of Pwllymeidw, St. Dogmaels. E. C. Evans ran a guest house in the surviving service range, referred to in 1955. In January 1972 Thomas Geraint Davies of Cilbronnau won a horse race at Haydock Park on ‘Twigaivy’. The property was sold in 1978. The 6 bedroom property was advertised for sale again in October 2001 and June 2004. Former service range of c1900, now house, in painted stucco with mock half-timber effect to first floor, pitched slate roof and grey brick stacks. Possibly to plans by David Jenkins of Llandeilo for Sir Lawrence Hugh Jenkins. Main façade is 2 storey, 6-window range. Gable section to left with mock timber effect to gable, C20 quadripartite first floor window. Ground floor has 6-pane similar window – casement style. Central 4-window section is set back, with blank left return wall. First floor has eaves-breaking plate glass sashes beneath gablets with slate roofs. Mock timber effect, including sill band, to first floor. Ground floor has similar sashes. Projecting gabled range to right has timber effect to first floor and tripartite first floor window. Ground floor obscured by projection with gabled front, pitched slate roof cinquepartite window and plain left return wall. The roof has an odd flying buttress from the main wall to the front gable. INTERIOR: Main reception room retains mahogany fireplace with marble column and wrought iron hearth. Sale Particulars – Cilbronnau, John Francis 14/06/2004. Very much enjoy following your website. Trying to trace my husbands family tree and you seem to have done so much already! Would like to get hold of copy of your research on Cardigan if you could let me know how to do so please. Thanks for the comments. I’ll be posting more on Cardigan Castle to tie in with the opening in the Spring of next year – I’ve currently got a time-line on the castle and an entry for the Grosvenor Hotel, formerly Bridge House, Bridge Street, Cardigan – both of which might have useful material. If you’d like me to e-mail you personally with information for yourself and your husband, please contact me again and I’ll send you some more material – it’s a very interesting family! I was most interested to read about Cilbronnau, as Minna Jenkins was my great-aunt. My father John Milford (1905-1974) wrote that he used to visit the family between 1913-1920, going by train to Carmarthen and in the earlier years being met by a pony and trap. He remembered cycling down the long drive with Gloderydd, who joined the Welch Guards and died of a malaria in Egypt. My father visited Minna in Nice in 1931 – she had dyed her hair green! Whilst her husband was busy in India, she took the opportunity to visit Tibet on a shooting expedition, just accompanied by bearers, and her account of this, Sport and Travel in both Tibets, published in 1909, is a fascinating account of this trip. I understant that at some stage her tropies were displayed at Camarthen town hall. Minna was born in Natal to my great grandfather Andrew Kennedy. He married Georgina Heathcote, who was a grandaughter of Thomas Phillips, one of the 1820 settlers, son of the rector of Lampeter Velfrey. Thanks to your blog, I now know that the house passed back to a Phillips. Hi – thanks for the post – sorry about the delay in replying – I’ve got very patchy internet access for a few weeks. Fascinated to hear of your connection to the family. On re-reading what I wrote above, should have said Cardigan rather than Camarthen town hall, which I plan to visit shortly to see if the trophies are still there! 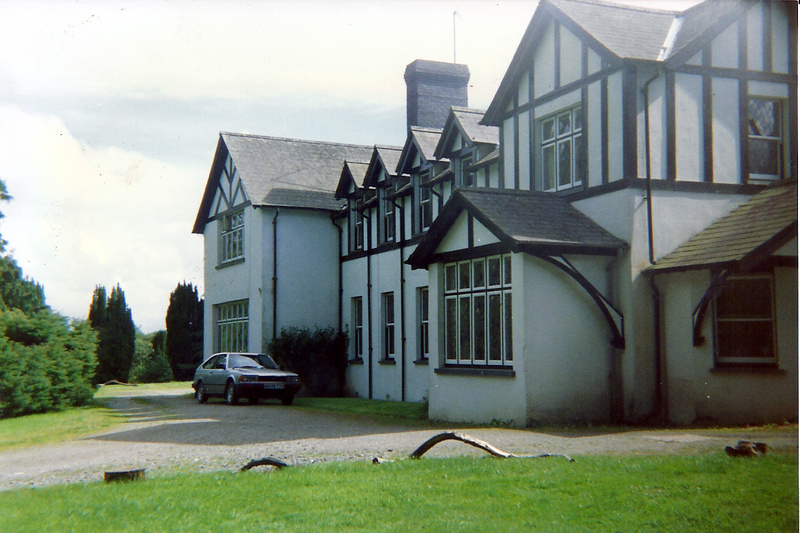 My family moved into Cilbronnau Lodge in 1960 and left in 2000. I spent many a happy time down in the mansion. Hywel Davies the jockey that won the Grand National lived the for many years. I should have mentioned that the RAOB lodge in Cardigan was named the Cilbronnau Lodge as it was started by the gentleman living in the mansion.